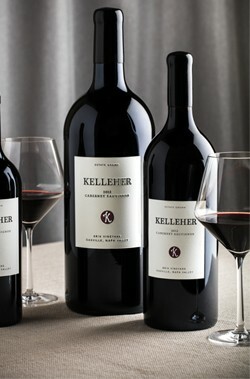 Our 2012 Kelleher “Brix Vineyard” Cabernet Sauvignon is the most approachable vintage we have offered in release. Aromas of crushed violets and crème de cassis mingle with roasted espresso and shaved dark chocolate. The palate adds sweet Bing cherry fruit with complex layers of cola, star anise, clove and porcini powder. The richly textured, creamy mouth feel leads to soft, ripe tannins on the long finish. Drink now or let age for many years to come. Ratings 92 Points-Robert Parker "The 2012 Cabernet Sauvignon reveals ripe blackberry and blackcurrant fruit with graphite, licorice, forest floor and new saddle leather, with toasty vanilla lurking in the background. It is full-bodied, fleshy and dramatic as it is a faithful reflection of this ostentatious and impressive vintage. Drink it over the next 12-15+ years." Food Pairing Notes Our Cabernet Sauvignon will pair beautifully with lamb, rib-eye, filet, blue cheese.